You are currently browsing the category archive for the ‘Marrickville Council Meetings’ category. 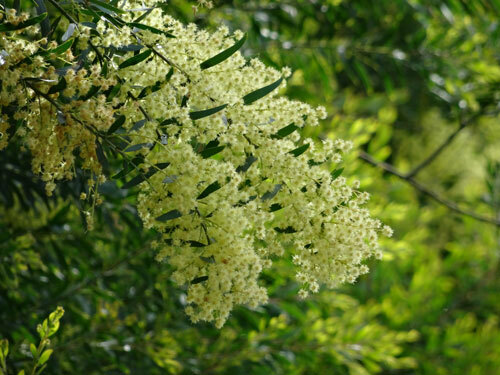 Wattle is in flower at the bush pocket on Victoria Road. For: Clrs Haylen (Lab), Woods (Lab), Iskandar (Lab), Macri (Ind), Gardiner (Ind), Hanna (Ind) & Tyler (Lib). Against: Clrs Ellsmore (Greens)- Phillips (Greens), Leary (Greens), Brooks (Greens) & Ellsmore (Greens). Clr Gardiner was elected as a Liberal candidate, along with Clr Tyler. Clr Gardiner is now an Independent Councillor. Clr Morris Hanna & Clr Sylvie Ellsmore put themselves up for the position of Deputy Mayor. The vote was the same as the position of Mayor with Clr Hanna being voted Deputy Mayor. For the positions of the Committee Chair & Deputy Chair the voting was the same as above. Congratulations to Mayor Gardiner & Deputy Mayor Hanna. 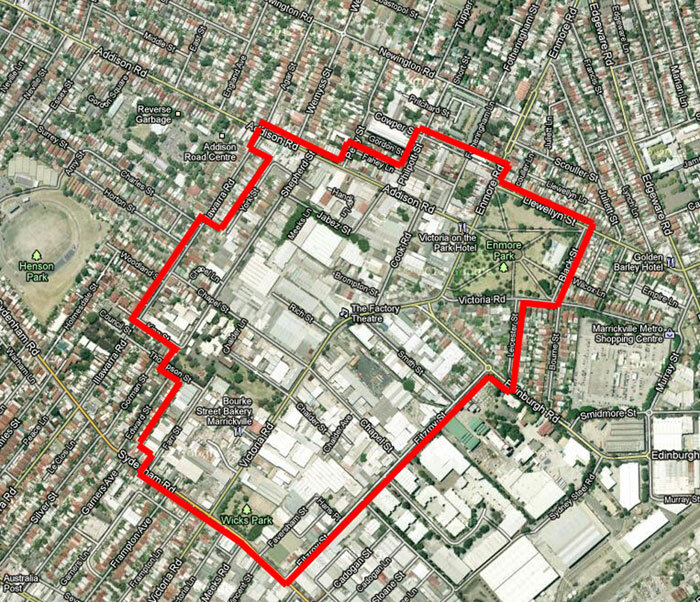 Showing the boundary of the proposed Victoria Road Precinct. Click to enlarge. This was the Infrastructure, Planning & Environmnetal Services Committee. All Councillors attended. The Councillors & Wards are as follows – LABOR: Iskandar/Central, Haylen/North, Woods/South. GREENS: Phillips/Central, Ellsmore/North, Brooks/West, Leary/South. LIBERALS: Gardener/North, Tyler/West INDEPENDENT: Macri/Central, Hanna/South. The following is how I understood the meeting & all mistakes are mine. Status Update Report preliminary planning proposal for part of the Marrickville/Sydenham Industrial Area – Victoria Road Precinct. – The proponent wants to amend the Local Environment Plan (LEP) to change the zoning of 18-hectares of industrial zone ‘employment lands’ to provide “creative industries” & residential housing to a “maximum building heights to 14-stories” with a 3:5:1 floor/space ratio. Clr Macri put up an amendment to send the proposal to Gateway for assessment. FOR: Clrs Macri, Hanna, Iskandar, Woods, Tyler & Gardiner. AGAINST: Clrs Brooks, Leary, Phillips, Ellsmore & Haylen. The proposal now goes to Gateway. The debate lasted around 2-hours, so would be too much content to post here. Instead I will quote some of the more memorable comments by Councillors in the order of speakers. Cr Macri: Our staff are reading the rule books. I can see merit in the proposal. I grew up in the area. I hope this proposal can move us to a better outcome. I can see overhead pedestrian bridges & open public space. When I was Mayor we made things happen. I haven’t given up. We have to move forward. We are the Councillors & we drive the agenda. In Arlington, our kids are out there playing soccer, while others are stuck at home. Clr Phillips: Clr Marci doesn’t even live in the area. Clr Macri: I work in the area. Clr Gardiner: The Greens Press Release says it will drastically change the area & it will. This area is a disgrace – an urban blight. Clr Phillips: It stayed an employment area in the LEP because it was close to the airport & Port Botany. Where will the employment lands be? Staff say if we send to Gateway this gives the message that Marrickville Council endorses the plan. We shouldn’t endorse a plan that has serious flaws that the community doesn’t know about. It cost Council $2 million to consult with the community to develop the LEP & the LEP did not have this area rezoned for 3,000 extra dwellings. 3:5:1 floor/space ratio is rarely found in this area. Clr Ellsmore: We are exceeding our housing dwellings. Clr Hanna: I am sick of residents coming to me & saying my kids can’t buy in the area. The RSL units were bought for $500,000 & now selling for $750,000. Do we want people buying from the Eastern Suburbs & the North Shore & not the kids of Marrickville? The petition was a waste of my time because the postcodes were not in the area. Last time I was told, you will lose, but I got more votes than before. I am running again. 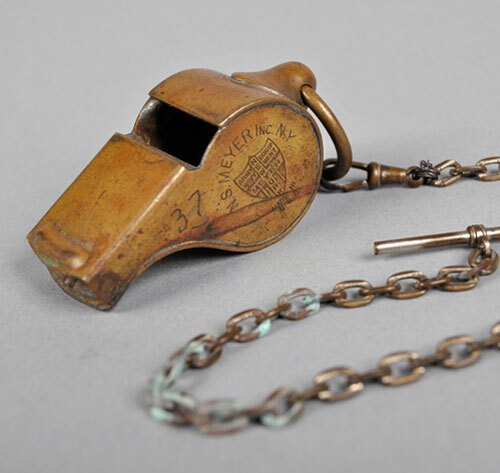 [for a position as Councillor]. Clr Woods: We struggle with most employment lands & we don’t employ anyone. The heavy lifting is in the South Ward. Item 5: a 10.8 hectare rezoning near Sydenham Station to become a light music hub. I will be interested to see if this gets the same response to the Victoria Road Precinct. Clr Leary: Do we really think that these properties will be selling at an affordable price? We are talking about thousands of new residents. I catch the bus to work & the buses go past full. Recently some of our bus stops have been closed down. Our transport is to capacity. If you bring in 6,000 to 9,000 people, where are they going to stand to catch the buses? Clrs voted to LEP that increased density beyond what we thought comfortable & now we have a whole new ball game. Clr Brooks: Property economists will tell you that buildings like this will not help single people or families. There is no evidence that affordability will be achieved at all. Clr Macri: Marrickville is evolving. I’ve been around for 45-years & it is changing. If you want to know what Sydney will look like, look at other cities. This was the Development Assessment Committee Meeting. Absent: Clrs Tsardoulias, Hanna, Brooks & Leary. 459-463 Illawarra Road Marrickville – extend the trading hours of Woolworths supermarket to 7.30am – 10pm on Saturdays & 8am – 10pm Sundays & public holidays. Council considered that extended trading hours would not have a detrimental effect on the surrounding area & recommended a 12-month trial. First speaker from Woolworths: Said customers needed to be explained why store closed at 4pm on Sundays. There were 560 signatures on a petition to allow extended trading hours. Woolworths distributed 15,000 leaflets. Said trading to 4pm is inconsistent with other stores & what is proposed is consistent with zoning. There are no proposed changes to the loading dock. The store employs 130 people. Woolworths is a local company owned by hundreds & thousands of Australians. The supermarket sells the essentials of life. The changes make things easier for families to buy essentials when they want to buy them. Resident 1: This application is similar to the one in 2011 that Council rejected because it would have a significant impact on the surrounding area. Nothing has changed. It will still generate a high level of traffic, trolley dumping, loitering, noise & litter. The business paper has a perspective that this is a commercial area, but it is a predominantly a residential area. The business paper says approval would be unlikely to result in an increase in traffic & noise. This cannot be correct. Many of the shoppers use cars. If you walk down Renwick Street at 5pm on Sunday, this is the only quiet time in the whole week. The business paper also points out other shops open after 4pm. The figures are wrong. Only eight operate after 8pm. These are boutique shops, not comparable to large Woolworths. The fact is that these small corner stores cater to shoppers past 4pm. Shoppers can also go to Wolli Creek & Metro. Market Town in Leichhardt operates from 10am – 4pm on Sundays. I am asking Council not to reconsider its 2011 decision. If there is a 12-month trial, traffic monitoring of the area is needed. More work needs to be done for pre & post traffic measurement for it to be a meaningful trial. Resident 2: We have no objections to extra hours on Saturday & think that 10am – 4pm on Sunday is ample. We encounter daily high traffic, blocked driveway, rubbish everywhere. People sit under the ramp & drink alcohol & urinate. Faeces can be smelt. Alcohol use outside Woolworths has risen ten-fold since the liquor outlet was opened. There has been an increase in robberies & bags stolen from homes. We have a small respite in the week & we would like to keep it. When it is quiet, the street is not packed with cars. We can hear the PA system at 10pm. Woolworths doesn’t need the extra income. Wolli Creek, Metro & Banana Joes is open on Sunday evenings. The residents deserve to keep this small window. Resident 3: I will not address the merits of the DA. What I will say is about Council’s conduct. The business paper speaks about Community Consultation. What it does not tell you is that the advertisement that I saw said: “It should be noted that comments received will not be treated confidentially and may be viewed by the applicant.” It is a blanket practice allowing access to identifiers: names, addresses, contact details. No-one has a say as to whether they wish their identifiers not be accessible to DA proponents. This is inconsistent with others Councils. For example, Sydney Council’s invites subitters to say if they wish their anonymity to be respected. A similar direction is on the Information and Privacy Commission’s website. Council’s advertisement is not consistent with its obligations under the GIPA Act. The GIPA Act does not say that Council must allow access to personal information in DA files. It does not say that Council is permitted to allow access without undertaking the statutory balancing exercise to ascertain if there is an overriding right that makes access inappropriate. The community’s privacy right is such a right. It protects identifiers & contact details. Allowing access to identifiers creates a chilling effect on the community. It creates a fear that personal information will be available to every developer. You get fewer submissions. It is not for developers to be checking whether a submission is genuine & who made it. This is Council’s function. Identifiers do not improve a proponent’s capacity to respond to any community comments. People said to me this is not right. I don’t want developers to know who I am, where I live, what my contacts are. This is for Council to know. A person said I am a silent voter. I will not make any submissions to Council when it allows access to my name & address. Just knowing that identifiers may be accessible is enough to create a chilling effect. The business paper does not tell you that the Privacy Commissioner is examining Council’s practice & has now written to Council. There have been two Tribunal decisions where developers tried to obtain access to identifiers, which they did not know. Both developers lost. You may choose to approve the recommendation. But it is the product of a process inconsistent with Council’s privacy obligations. The right thing is a resolution that asks Council to re-advertise the DA, clearly saying what the law is. That is, identifiers will not be accessible without an opportunity to have a say about privacy & without Council complying with the test that the GIPA Act requires of all government agencies. Your resolution should also include a paragraph that asks Council to write to submitters & clearly inform them if Council allowed access to un-redacted submissions in this case & exactly to whom it allowed access, so that submitters can think about whether they wish to make privacy complaints. Clr Macri moved the motion to support extended trading hours for Woolworths. Clr Phillips: Said he will not support the motion, but was moving two amendments. I used to live in South Marrickville & felt confused when Woolworths shut down at 4pm. I do think extended hours will support the community. It does affect the residents’ convenience. The headlights shine directly into the lounge room opposite. Council should do something about that issue. Amendment 1: Woolworths to work with Marrickville Council to do streetscape work to stop lights affecting this house. Amendment 2: Recognise this is a residential area & that residents do rely on this respite. 8pm is a reasonable compromise & recognizes residents’ amenity. He thanked the resident regarding the issue of privacy. I am of a mind to raise a matter arising about how Marrickville Council compares & whether submitter details were passed on to Woolworths. Staff: The Manager of Governance looks after this. My understanding is that certain details are always redacted. This is not my area, so I cannot comment. Clr Macri: This is only a 12-month trail, so there is a lot of pressure on Woolworths in how they fit into the community. We are looking at a Plan of Management for that site & environs so they are appropriately managed. They are changing their status quo. Regarding the community safety issues; passive surveillance means there is less crime. With no people, there is a rise in crime. The liquor hours will be staying as they are. I am comfortable with a trial. I am happy to support the amendment regarding the streetscape opposite. I’d like a discussion with residents without first thrusting it upon them. We need to actually allow the full trial with the hours they are asking. Mayor Haylen: I appreciate the concerns of residents. Woolworths has an action plan re loitering, litter etc. I am satisfied on this front. I am looking forward to shopping there on a Sunday. The shops around here told me they are looking forwards to more business too. 134 people are employed & an extra 6-hours allows more kids an employment opportunity. If Woolworths doesn’t uphold its end of the bargain, they will be back in 12-months. I support amendment 1, but not amendment 2. Clr Gardiner: I don’t support Amendment 1. It bothers me that an application can be ambushed. What does it mean – Woolworths to work with Marrickville Council? Stop headlight spill – which house? It’s half-baked & not thought through. The amendments should been discussed with staff. Clr Phillips: Amendment change – That Woolworths work with Marrickville Council & local residents. I have faith that Woolworths want to do the right thing. The wording is vague. I would hope that Marrickville Council works with Woolworths & residents. I’ve driven out the Woolworths driveway 150 times. We are asking for approval for something that will have an impact on these residents. It is not half-baked. Vote on Amendment 2 – Opening hours Sunday 8am – 8pm – For: Clrs Ellsmore & Phillips. Against: Mayor Haylen, Clrs Macri, Iskandar, Woods, Gardiner & Tyler. Lost. Vote on Amendment 1 – streetscaping to stop headlight spill into a house – For: Mayor Haylen, Clrs Ellsmore, Phillips & Macri. Against: Clrs Iskandar, Woods, Gardiner & Tyler. Carried with Clr Macri’s casting vote. Vote to approve the Motion for extended operating hours for Woolworths – For: Mayor Haylen, Clrs Ellsmore, Phillips, Gardiner, Tyler & Macri. Against: Clrs Woods & Iskandar. Carried. Clr Phillips: Privacy Issue Arising: Motion that Council prepare a report about its consultation practices & personal privacy as to how they compare with other councils & comply with the law. Motion carried unanimously. NOTE: Resident 3 told me he spoke with Council staff during 3 phone calls in May & after some initial inconsistent advice, he was told that Council does allow developers to view community submissions without concealing identifiers. Two branches left & this is not an isolated example. I was reading the business papers today & decided that Council staff comments should be shared. LOW VOLTAGE LINES: 1m clearance at all times & an extra 2m ‘regrowth zone’ resulting in a total 3m pruning. AERIAL BUNDLED CABLE: 0.6m at all times & an extra 2m ‘regrowth zone’ resulting in a total 2.6m pruning. Council are writing to Networks NSW to request an amendment to the above guidelines. Ausgrid committed to improving the quality of their street tree pruning & also committed to contacting Council regarding any public tree where necessary pruning could render the tree unviable. Ausgrid will remove all tree pruning material before they leave the area, instead of leaving them overnight taking away residents car parking spaces. 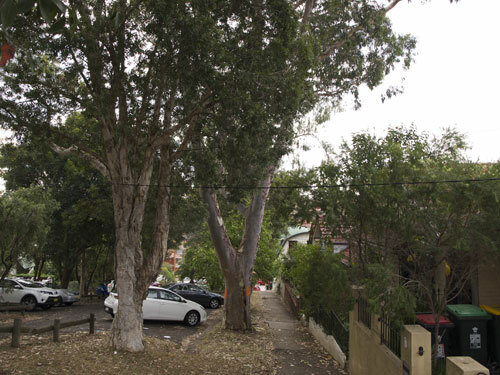 Marrickville Council itself has said that they will plant only small tree species under powerlines as part of their upcoming Street Tree Master Plan. Considering that aerial bundled cabling is expensive, I do not understand why the benefits only amount to less than half a metre. Also, pruning to 1m below the telecommunications cables has not been mentioned. I have received information on good authority that pruning for these cables is unnecessary, as contact with trees does not create a safety hazard. Considering that the NBN cable will also likely be attached to powerlines in some areas, this will mean a much lower ‘regrowth zone’ if current pruning to protect telecommunications cables is followed. If this does happen, even a small stature tree will be unsuitable for under powerlines. There is no amenity left in this street tree in Warren Road & this is what is being done to the street trees all through our streets. 1. 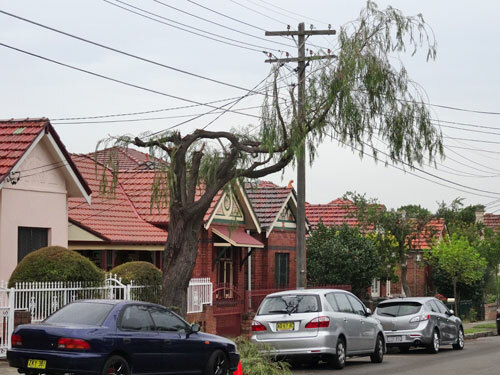 Council expresses its grave concerns about the recent changes to street tree pruning practices being implemented by Ausgrid & considers the methods excessive & unreasonable. 2. Ausgrid provide immediate clarification to Council of the authority vested in it by NSW Electricity Supply Act 1995 to prune for clearance data & communications cables as opposed to its own electrical wires. 3. 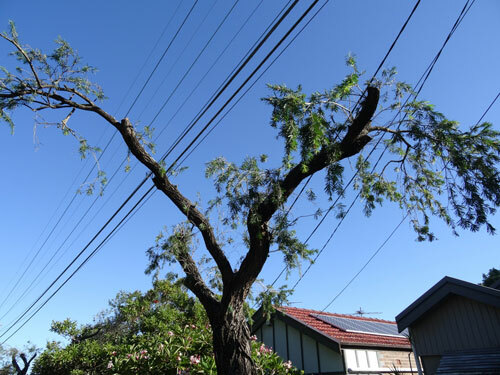 Ausgrid provide resources for the aerial bundling of overhead wires in locations where the impact of tree pruning on street & park trees is excessive & unacceptable. 4. Council review its standard conditions of development for larger developments to aspire to provide for the undergrounding of overhead wires & data cables at no cost to Council. 5. Council’s proposed Street Tree Master Plan identify the need for the selection of street tree species to take account of the site conditions, including the presence of overhead wires. 6. Council consider, as part of future budgets, the need for ongoing allocation of new funds to provide for the regular pruning of street trees by Council’s own contractors. 7. 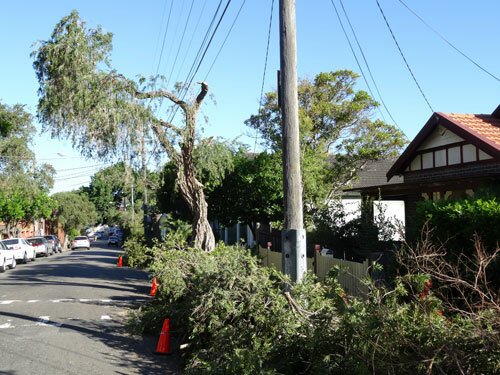 Council write to the NSW Minister of Resource & Energy, Anthony Roberts, MP, expressing its concerns about recent changes to Electricity Network Standards, adopted by Ausgrid, that require tree clearances of up to 3.0 metres to overhead wires. Further that Council requests that urgent consideration be given to the amendment of these standards to provide for more reasonable clearances, no more than previously in force. Halleluiah! Finally, something will be done & hopefully before Ausgrid remove the remaining tree canopy throughout Marrickville municipality. “The power cables are all attached to cross arms, the lowest ones are for normal residential use, those above are for high voltage, the bigger the insulators the higher the voltage. 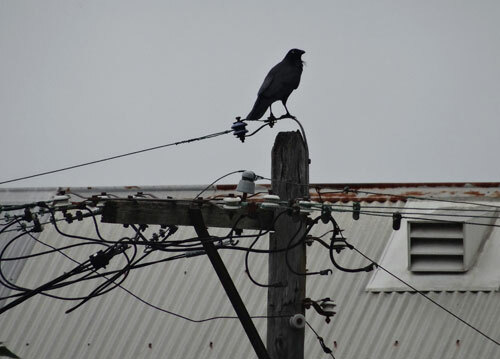 Telstra have been using power poles for many years to deliver telephone services. In Sydney you will find that they still have over 40% of their network attached to poles. It is not all underground, as many people believe. Optus cables are hung approx 1-metre below the low voltage power cables. This was done as they found it to expensive to use Telstra’s network and it was not feasible to run it underground. Foxtel cable is then hung approximately x 1-metre below the Optus Cables. This was done as a fast and efficient method to roll out Pay TV and be competitive with Optus. Foxtel/Telstra cables are very low voltage; the same as the Optus cables. There is no real reason to vandalise the trees, but the contractors are cowboys and use the excuse that they could cause a problem. The only problem that could happen is that people lose their phone or Pay TV connection if a tree branch damaged the cable. The power companies are covered by an act of parliament that allows them to prune if required because of the problems caused if their cables are damaged. We should also be aware that the NBN mob are putting pressure on the Government to allow them to also go up on the poles, even though the power companies are opposed to it. The Pay TV and telephone cables are causing huge problems for the power companies because it takes the telco’s too long to fix or move their cables when there is a problem. I understand that at this time the Pay TV and telcos cannot put any more cables on the power poles. They can only replace like for like if a cable is damaged. The other thing that causes issues is that no one really knows who actually owns all the poles. There are the power companies’, Telstra, State Rail and privately owned poles. Very confusing. One last thing I would like to know is why Ausgrid need to do 18-month pruning cycles, when Energy Australia managed quite well with 7-8 year cycles. Four to five extra pruning visits seems a lot for the public to have to pay for, while at the same time losing amenity. Thank you to Marrickville Council for taking a stand on this issue. The trees, the wildlife & the community deserve much more than having their street trees butchered in the manner in which they have been. This is what was proposed – 16-storeys, but not ethereal like the image makes the tower out to be. Peer Review said the proposal would likely create a windy space, lack of shade due to limited shade trees …. a corporate image with little amenity. 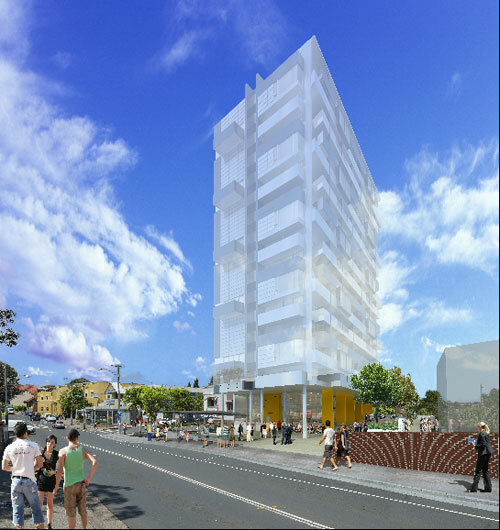 Marrickville Councillors knocked back this development proposal, which many residents, including myself, believed would have killed Marrickville & set a precedent for many more tower developments. In essence the planning proposal for 2-18 Station Street & 1 Leofrene Avenue Marrickville sought to amend the Marrickville Local Environment Plan (MLEP) to change the zoning, floor/space ratio, as well as increase building height limits from 8-storeys to a whopping 16-storeys & develop 120 units & approx 510-sq-metres of retail floor space. The developer also wanted to enter into a Voluntary Planning Agreement (where they give something in return for consent) & this was to be a small plaza/courtyard area under the awning of the building & part of the above ground access to the railway station. It was suggested this will be a great place for the community to meet & perhaps hold markets. The Proposal was sent to the Department of Planning & Infrastructure for a Gateway determination. This was approved in December 2013. The proposal was also sent for Peer Review & to Transport NSW. Ease of access, lack of accessible car parking spaces close to the station, safe, logical access for all commuters, access for emergency service & maintenance vehicles, management of pedestrian thoroughfares & adequate management of stormwater. They also found that the concept plan encroached in TfNSW land & this has not been consented to. Importantly, the raised plaza is incompatible with the proposed Marrickville Railway Station upgrade. TfNSW has also committed to funding public domain improvement works in Station Street, which may not be available if the raised plaza goes ahead. The area is too small to create a successful two level plaza approach. Problems with Australian standards for access. The proposal would likely create a windy space, lack of shade due to limited canopy trees, need for more soft landscaping & inclusion of seats & bicycle parking. Security & safety concerns of commuters. Proposed building is over-scaled, overbearing & out of character. Location of public parking is inconvenient, poor passive surveillance & likely to be considered unsafe. The proposed design is an overdevelopment of the site. Significant visual & overshadowing impacts. Public space compromised by sloped areas, stairs & building structure. Laneway is too narrow & unsafe. Plaza would be in shade for most of winter. Lack of public benefit of a ‘memorial park’ at 2 Leofrene Street, as it is small & would be overshadowed by the building. Height, bulk & scale would dominant views & is out of character. I was not present, but received the following update from a resident who attended the Council Meeting. “Attended the Council Meeting earlier this evening. [There were] three excellent speakers; Laura & Matt from Schwebel Street & Jeanette from Leofrene Avenue. The developers were in attendance, but did not speak. Based on the findings (from Peer Reviews & Council Officers) & recommendations of the Peer reviews and with the benefit of the final plans for the upgrade of Marrickville Station this report recommends a revised option for the maximum development potential of the land. Retain Council ownership of the balance of Station St road reserve. Upgrade the public domain of the existing street rather than construct a raised plaza structure. Limit the building to a maximum height of 9 storeys. Recommendation was that Council requests the proponent submit an amended planning proposal for Council’s consideration prior to public exhibition that addresses the issues & is consistent with the preferred option outlined in this report. The Mayor [Haylen] added an amendment, which was related to integrating the station upgrade. Greens South Ward Councillor David Leary moved an amendment that the building should be within the MLEP 2011. Clr Gardener had a go at the Greens for not voting for the LEP & now trying to use it & had a go at all those people who use social media to say bad things about him. Clr Macri & Clr Tsardoulias talked about process & at length about how the Save Station Street group [a local residents action group] were all Greens stooges & they didn’t think it was right that people didn’t say nice things about them on Social Media, when they sent the proposal off to Gateway rather than follow Council Officers recommendation that Peer Reviews be conducted BEFORE sending to Gateway process. The votes supporting Clr Leary’s amendment to require resubmitted plans to comply strictly with the Marrickville LEP: Clrs Leary, Phillips, Brooks & Ellsmore. Against: Mayor Haylen, Clrs Iskandar, Tsardoulias, Woods, Gardiner Gardener, Tyler, Hanna & Macri. The votes supporting Council’s recommendation: Mayor Haylen, Clrs Iskandar, Tsardoulias, Woods, Brooks, Ellsmore, Gardiner Gardener, Tyler, Hanna & Macri. Against: Clrs Leary & Phillips. Recommendation passed. Most of the street tree canopy was on the ground. Motion: That council place a moratorium on AusGrid and its contractors pruning street trees in the Marrickville Local Government Area until AusGrid commits to enforcing far higher standards of pruning and demonstrates that it will protect and respect the street tree assets of Marrickville. Background: In recent times many members of the community have contacted councillors to complain about the street tree pruning activities by AusGrid contractors. They are disturbed that the street tree pruning is being implemented with little regard for the health of the tree, the aesthetics of the tree, and far beyond historical practice and the actual needs to protect electricity infrastructure. While AusGrid has a legal right to prune trees to protect its assets from damage, they do not have the right to excessively damage council assets. Mature and semi-mature street trees are worth thousands and thousands of dollars and take a long time to replace. They are also provide value services to the community, including streetscape aesthetics, shading and cooling, ecology, filtering the air, and boosting property values. For many residents the street trees contribute to the character of their neighbourhood. To come home to find the trees on their street have been mutilated unnecessarily can be quite disturbing – to watch them being excessively pruned can be worse! There may have been a recent change in AusGrid instructions, or the contractors used, or the intervals between prunings? Whatever has happened has resulted in what may be politely referred to as ‘overzealous’ street tree pruning. Some residents have referred to it as ‘abuse’ and ‘mutilation’ of the trees. There is big news right at the start of Marrickville Council Meetings for the New Year, which commences next Tuesday. I suspect it will be ongoing news for some time. In late 2012 building corporation Meriton made an offer of $5 million to Marrickville Council to be allowed to add a further 10-storeys to one of the towers of controversial Lewisham Towers development. This would have taken the tower from 10-storeys to 20 storeys. Greens Councillor Max Phillips informed the community, with the Sydney Morning Herald publishing an article about Meriton’s offer on 11th December 2012. Clr Phillips has always maintained that he was not aware that the oral briefing from staff to Councillors was confidential. The matter was referred to the Division of Local Government who suspended Clr Phillips for a period of two months starting on 17th February 2014 because he refused to apologise for this actions. Essentially, Clr Phillips was not punished for informing the community of the $5 million dollar offer by Meriton to Marrickville Council. He was punished for refusing to apologise for doing so. Clr Phillips is appealing the suspension. “I’ve been informed that the Division of Local Government has ordered my suspension as a Marrickville councillor for 2 months starting 17 Feb. The suspension is because I refuse to apologise for letting the community know about a developer proposal on the Lewisham Towers in late 2012. I am refusing to apologise because I am not sorry and believe I acted ethically in informing the community. I could offer an insincere apology, but that would be dishonest and I refuse to lie. Any money offers from developers to obtain extra storeys above the planning instrument levels should be made known to the community. The community should have a right to make submissions to the decision-makers (our Councillors) as to whether it thinks any offer is acceptable & a good bargain for the obvious loss it suffers from over development. Many in our community are appalled & feel very unsafe that the Local Environment Plan can be overturned because of a Voluntary Planning Agreement, which is essentially money changing hands for a developer being able to go beyond the restrictions of the Local Environment Plan. With a significant section of the community in support of their right to know what sorts of deals may be on offer to secure favourable decisions for development over and above the standards in our planning instruments, it will be interesting to see how the appeal goes. In such climate the meetings of the new year may also make interesting viewing. The tree to be chopped down is dead centre of the photograph. This was the Council Meeting. The following is how I understood the meeting & all mistakes are mine. Absent: Clr Iskandar. Note: MC = Marrickville Council. The Councillors & Wards are as follows – LABOR: Iskandar/Central, Haylen/North, Tsardoulias/West, Woods/South. GREENS: Phillips/Central, Ellsmore/North, Brooks/West, Leary/South. LIBERAL: Gardiner/North, Tyler/West. INDEPENDENT: Macri/Central, Hanna/South. One speaker: For the tree removal. I am representing the views of 10 residences. They tabled a petition in favour of removing the tree. We don’t believe that the tree will not cause further damage. This tree is planted in sandy soil, which is not conducive of a tree that grows to 60-metres. Marrickville Council’s report does not mention the damage to property. A precedent was set in Shoalhaven Council where they have to pay $750,000 when a tree fell & killed a person. No-one knows if a tree is okay unless the roots are excavated. The paper makes the value of the tree more important than the fence. How can they tell without excavating the roots? We want the tree removed & replaced with a tree suitable for sandy soil. We don’t think this will set a precedence. This is unique because of the sandy topsoil. Clr Macri: Moved for the removal of the tree. I am disappointed that the resident had to be put through this again. It’s incumbent for us to make the right decision again. Clr Phillips: Said he would foreshadow an alternative motion. We are dealing with this again because other people in Day Street do not know about it. Community consultation showed quite a few neighbours & others were concerned about the removal of this tree. The footpath & the fence can be repaired, the infrastructure can be made good & the tree saved. Motion: 1. Not to remove the tree. 2. Repair footpath urgently. 3. MC to work with residents to fix the fence up to $5,000. This is a reasonable way forward to save a valuable asset. $40,000 is a significant asset. Clr Woods: The petition was delivered to me on Sunday. The residents explained that they had problems getting to everyone in the street. The petition contains 10 signatures from houses. One resident said we are concentrating on homes immediately affected. They said 4 residences were reluctant to remove the tree. There are no winners in tree debates & some residents thought the debate intimidating. Vote to remove the tree – Mayor Haylen, Clrs Macri, Tsardoulias, Woods, Gardiner, Tyler & Hanna. Against: Clrs Leary, Phillips, Brooks & Ellsmore. Carried. The tree will be removed. Here ends the Report for this meeting. 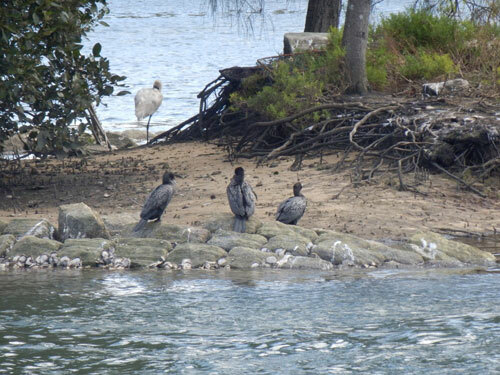 An Egret & three Cormorants resting on Fatima Island – September 2013. It’s not unusual to see Peilicans, Darters, Gulls, Herons or Spoonbills on the island. Speaker 1: For. I am a local resident & an Ecologist at the University of New South Wales. My doctoral thesis is on biochemical mediated interactions in aquatic communities & I am currently working on a wetland restoration project at Kurnell in conjunction with the Sutherland Shire Council & the Catchment Management Authority. While Fatima Island is not listed as ‘Ecological Significant’ this does not mean that it does not provide valuable ecosystem services. Indeed if we only concerned ourselves with protecting ‘ecologically significant’ ecosystems, our community would be a very stark & bleak place to live. The most obvious ecosystem service that Fatima Island provides is that of a bird refuge, but this is only one function of many. There are also intertidal & sub-tidal ecosystems to be considered. While Marrickville Council has undertaken wonderful work with rain gardens & the Tempe Wetlands to improve the health of the waterways, the bacterial communities of the intertidal & sub-tidal ecosystems of Fatima Island also play a part in the health of the river. Additionally the physical structure of the intertidal & sub-tidal region may provide additional habitat or nursery grounds for macro fauna. There has been a spirited debate on the internet about the fate of Fatima Island over the past few weeks & I would like to place the ‘let nature take its course’ argument into an ecological framework. Yes ‘islands come & islands go’, but islands come slowly, rarely & in undisturbed locations, & I would love someone to show me the latest river island that has developed in the Cooks River, or even the latest river island that has developed in NSW. And yes, Fatima Island will be affected by rising sea levels, but it will also be affected by changing tidal regimes & lower (and/or) higher rainfall conditions, as well as anthropogenic changes to our water run-off regime. If the decline of Fatima Island was solely part of the natural cycle, & only being impacted on by ‘natural’ causes, then I would possibly agree with ‘leave it be’ mentality. But it is not only being impacted on by ‘natural’ processes, & if we take the time to understand the geomorphologic & hydrological conditions around the island, we can plan a restoration that will allow Fatima Island to adjust & adapt to changing climatic & environmental conditions – a concept known as ‘planned retreat’. Ecosystem function is not the only value Fatima Island has, & others have/will address the cultural & heritage value of the island. It may not be possible to address or save all three aspects of the Island simultaneously, however all three aspects have one thing in common. Action needs to be taken sooner rather than later. Recreating ecosystem function is much more expensive & less likely to succeed then preserving what we already have. Cultural & heritage value cannot be recreated. Speaker 2: I did not take notes. This person spoke in depth about the history of Fatima Island. Speaker 3: When the Cooks River Valley Association (CRVA) started campaigning about Fatima Island just over 12-months ago, we got a strong response from people who have a history with the island. In recent weeks this response has escalated, including various community groups – Marrickville Heritage Society, Wolli Creek Preservation Society, Saving Our Trees network, NSW Heritage Network, Catholic Parish at Tempe as well as a strong response from individuals who all see the significance of the island. CRVA raised concerns that the island was not included in the Biodiversity Strategy or Recreation Strategy. At the last Meeting of the Cooks River Alliance CRVA we agreed that a letter be written to the Minister of Primary Industries. I ask that you endorse spending. Mayor Haylen: Move motion to – 1. Receive & note. 2. Include Fatima Island in Biodiversity Action Plan. 3. Recognise that funding is unlikely. 4. Investigate funding opportunities & recognize the island as a significant site. 5. Proceed with spending the $25,000 for the report. I recognise Clrs have concerns with this expenditure. I’ve investigated using volunteers with the Tempe Motorboat Association. We need a proper study done & to put our best case forward about the island’s preservation. I’ve received hundreds of emails about Fatima Island. Clr Leary: I support. I know some Clrs may be concerned about spending $25,000, but if we put into context, tonight’s demolition of two toilet blocks were budgeted at $25,000 each. Clr Tsardoulias: Put up an amendment to delete point 5 of Mayor Haylen’s motion – “Proceed with spending the $25,000 for the report” & write to Sydney Water asking for funding. It’s the Cooks River. $25,000 is a lot of money & I’m not comfortable spending this on a report. The report will say, plant a few trees & leave it alone. I want the state government to say yes & fix up Fatima Island, the banks, clean up the river & allow canoes. Fatima Island is not part of my basic services. It’s state government services. Clr Gardiner: I endorse the amendment. My concern is the report will say it needs to be saved & this will cost several million dollars. I’d like to see a MC report to see if it really is of ecological importance. We are seeing a very narrow interest group. We should understand more before we raise expectations. Clr Tsardoulias just supported spending rate-payers money on 4% affordable housing at the new Marrickville Library site. It’s not our job to supply affordable housing & it’s not the rate-payers responsibility. Clr Hanna: Against the amendment. Clr Woods: We need to know what is happening to the island. It’s not a decision to save yet. We have been talking about the island for years. [He then read from a bunch of old newspaper articles about Fatima Island.] What the Mayor is suggesting is sensible. I’m supporting the expenditure. The vote for the Mayor’s amended motion – For: Mayor Haylen, Clrs Woods, Phillips, Leary, Brooks, Ellsmore, Gardener, Tyler & Hanna. Against: Clrs Macri & Tsardoulias. The amended motion was carried. 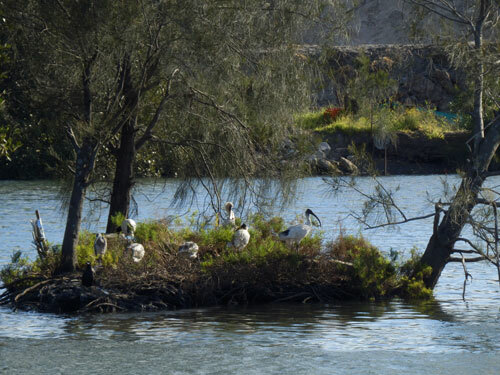 Five Ibis, one Royal Spoonbill &; one Grey-faced Heron taking a midday break on what is left of Fatima Island, opposite Kendrick Park in Tempe. October 2013.